I spoke with 2015 drafted defenseman Pat Holway, at the Detroit Red Wings’ annual prospect development camp in Traverse City, Michigan. 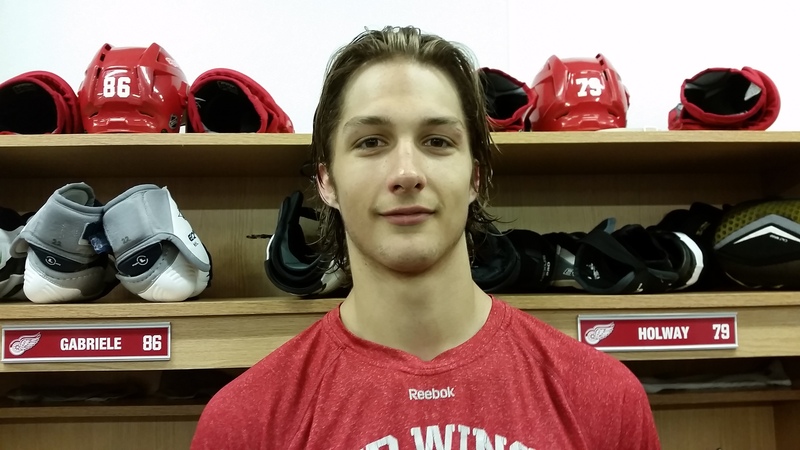 He talks about the camp, being drafted and meeting his hockey role model, Nick Lidstrom. This interview took place on July 5. It is part of a series of interviews (individual links below). Just describe your thoughts being drafted into this organization. Yeah, I mean it’s crazy, to be drafted, especially by a great organization like the Red Wings. Describe the emotion of getting drafted. A lot of phone calls, what was that experience like? Phone was ringing off the hook. It was a surreal experience. What were your first impressions of the camp? Everyone was great. Everything’s fast, up-tempo, and I just tried to keep up, now I’m trying to adjust and keep getting better and better throughout the week. Last year you were about a point-per-game player. Is that indicative of your style of play? I believe so. I think I’m more of an offensive defenseman. That’s what I think I play. I definitely play tight D too. I take pride in my D-zone. But, I look putting up points on the offensive side. What role did you play on your team last year in Boston (Tier 1 Elite Hockey League)? Power play time? Yeah, I was more of a power play guy. I mean it was kind of like, Tier 1’s a good league for young, upcoming players. So, it’s good to keep developing through there and then move on. Next year you’re playing in the USHL? Yup, for the Dubuque Fighting Saints. What do you think will be the difference between playing in Boston and now this new league? Do you think it’s a big step up? Definitely. It’s a lot faster, from Triple-A to USHL. There’s a lot in-between, but I think I’ll be ready for the speed, ready for the physicality, and hopefully ready for the season. What do you hope to take away from this camp in terms of what you need to work on the most or some of the off-ice? Yeah, definitely need to get stronger, gain more weight, so I can be dominant in the D-zone. I’m trying to learn everything from the coaches. I mean, I’m just trying to be all ears, it’s my first experience. There’s just so much to learn, even from the players. I mean, they’ve been here before, they’re proven players. So I just want to be able to learn from them. It’s a lot to take in, especially with the holiday weekend here, a lot to comprehend. Have any of these guys given you any advice or have you approached any of the guys who have been here multiple times? Yeah, I mean I’ll ask around like what we would do, what would be good things to do around here. They said, you know, keep it simple. You don’t want to overdo things. So, just kind of play it safe for the weekend. Make sure you play your game and don’t really worry about the rest. How about the scrimmage yesterday (Saturday), you had an assist on one of the goals. How was the pace out there? It was fast, definitely fast for me, especially coming from Triple-A, I hadn’t really experienced anything like that. But I thought I adjusted throughout the game pretty well to the speed. If you had to compare yourself to an NHL defenseman in terms of your gameplay, who would it be? I like Victor Hedman right now a lot. I mean, he’s a good puck-moving defenseman, jumps up in the rush, and he’s big and he’s physical as well. Did you have any favorite players growing up that you really liked to watch? Nick Lidstrom really. As a kid I would always watch him. Hall-of-Fame defenseman, he’s just unbelievable. Did he kind of inspire you to play professional hockey? Oh, absolutely. I mean, ever since I was a kid, you know, hockey, “what do you want to do,” play in the NHL. Have you had the chance to meet him yet? Yeah, I was at the Tigers game. I sat close to him and spoke with him for a little bit. He’s a very insightful guy. Was that a pretty surreal experience? Yeah, it almost didn’t seem real, had to pinch myself a little bit, but it went well. Did he give you any valuable advice coming into the camp? Yeah. He said be calm and be confident and you should be fine, and I thought that was very good advice. What is your favorite hockey memory throughout your life? I mean, getting drafted. That’s crazy. I can’t even put it into words really.